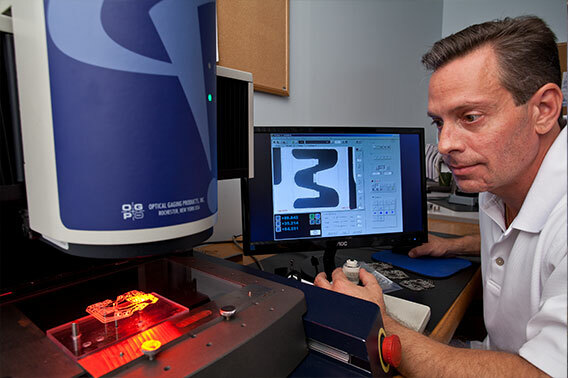 Sun Microstamping Technologies utilizes the AIAG Production Part Approval Process to ensure all requirements are documented, understood, and reliably implemented. As a component of the PPAP SUN is registered with the International Material Data System (IMDS) and we maintain all materials and components for submission to our customers when required. With particular focus on customer requirements and the FMEA our APQP team will define and document the total product plan. During the APQP process the team will prepare a “Job Program” for each independent production process, which includes the Process Flow Diagram, FMEA, Control Plan, Inspection Plan, Product Print and any Other Project Specific Documentation pertinent to the product. Upon completion of a New Tool Build or Transfer of a Tool SUN will complete a Production Trial Run (PTR) where all inputs and outputs of the Production Process are verified utilizing each of the 18 elements of the PPAP Process. Through the standardized use of this process our customers receive reliable delivery and service as well as reduced product variation. Production Part Approval is achieved through documented evidence of conformance to all customer, Industry and quality system requirements. While the APQP and PPAP Processes provide extensive up-front analysis, planning, and proactive measures to reduce product variation and opportunities for error they cannot always guarantee that a defective part will never be made. In order to further validate that the process is stable and will remain stable over time SUN executes a Safe Launch Plan (SLP). The Safe Launch Plan is an increase in Product and Process Inspections designed to identify and isolate concerns within the product or process. The Safe Launch Plan is successfully completed upon 30 – 90 days with Zero Defects. Following successful completion of the APQP, PPAP and SLP Processes each product is assigned a Product Manager who is the primary point of contact. The Product Manager works with each customer to Coordinate Production and Delivery Schedules, VA/VE Cost Reduction Activities and any other needs that may arise. SUN accepts all forms of customer schedule transmissions including EDI and other Electronic Delivery Scheduling Systems. Our team will continue to work proactively throughout the Production Life Cycle to improve Value, Technology, and Cost. Through the strong commitment and support of our Management Team we have developed our Processes to adjust, adapt and overcome Industry and project specific challenges while maintaining strict adherence to AIAG Standards, TS16949 Quality System Standards, and Customer Specific Requirements.